Home » Viral Posts » Why did the salmon cross the road? Dec. 20, 2016 - It's a familiar site in Puget Sound, Washington: Each November and December, chum salmon can be seen crossing flooded roadways along the Skokomish River. These salmon travel hundreds, if not thousands, of miles from the Pacific Ocean. After three to four years of feeding and growing in the ocean, they're driven to return to their natal river to spawn. 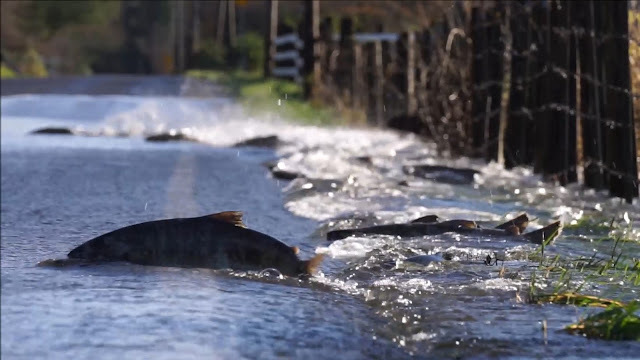 But when floods cause rivers to swell, sometimes the salmon go off course and have to make their way around unexpected obstacles, such as roadways.